Marketing planning: It’s often overlooked and under-prioritized. But, taking a closer look at planning — and investing in the tools you need to create agile, flexible plans — can help marketing organizations thrive. 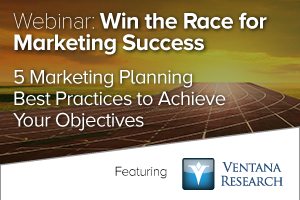 Last week, I led a webinar on marketing planning, Win the Race to Marketing Success: 5 Best Practices in Modern Marketing Planning. I was joined by Mark Smith, chief research officer at Ventana Research. You can check out the conversation on Twitter with the hashtag #planningmpm or read my recap below. How Frequently Do You Revise Your Marketing Plan? 34 percent of marketers revise their plans quarterly. 17 percent of marketers revise their plans as needed. Here’s what I’m seeing in my work with marketers: Updating your plan once a quarter isn’t enough. To respond to constant changes and high expectations, marketing has to be agile, ad hoc, and able to make incremental changes based on new requests and objectives. Mark agreed. He pointed out that marketing planning has a direct impact on other departments’ plans — sales, customer service, operations and finance. So, marketing needs to take planning more seriously, and develop its plan in partnership with other functions — not in isolation. Mark also shared research that shows the most successful marketing organizations have a team that works together to drive results. At those organizations, marketers aren’t working in silos, tracking data in spreadsheets they share via email. Instead, they’re using new tools to create a more unified approach to planning. Ready to rethink your marketing planning? Ventana Research has developed five best practices to guide you. Align the plan to business objectives. It’s easy to think about marketing planning in terms of tactics and channels. But the most successful marketing organizations start at the top by asking: What are our business objectives? What are the company’s big-picture goals? They think about both revenue and non-revenue goals, and align their planning to that framework. This isn’t happening now. Only three in 10 marketers said their plan is relevant to how the company actually operates. And, Mark added, planning gets more complicated with teams spread across different countries and time zones. It’s important to align your plan to business objectives so you can cascade that planning across teams. Use scenarios to determine priorities. The modern marketer faces rapid change. When business goals shift, marketers need to be able to make quick changes to their plan, using what-if or trade-off scenario planning (If we spend 30 percent more on X, what will the results be?). Of the marketers surveyed by Ventana Research, only 30 percent said their planning software can help them assess trade-offs well or very well. And 20 percent of marketers don’t explore trade-offs at all. If you can’t assess trade-offs and explore every relevant scenario, you’re at a significant disadvantage. I know I’ve seen our customers benefit from being able to access different scenarios. When something changes, instead of having to start from scratch on the marketing plan, they can pull down a scenario and look at the impact it will make. The reality of modern marketing is that if you’re making plans in a spreadsheet, the plan is probably out of date within a week. To stay agile and respond quickly, marketers need better planning resources. Use collaboration to establish alignment. Only 46 percent of organizations collaborate effectively in marketing planning. To develop multifaceted plans that benefit the entire enterprise, it’s important to think about the company’s entire team, not just your own. Are you able to share your plan with your leadership team? With the head of sales? With finance? Or IT? Marketing’s plan affects all of these other groups — their budgets and forecasts — so it’s important to work together. It’s important to think about marketing not as a function, but as an ecosystem. Giving everyone visibility into the plan helps create alignment. And this kind of collaboration is even more important for distributed teams working in different geographic locations. Companies are realizing that using purpose-built technology is important for all business areas. Companies have vested in CRM, supply chain software and ERP tools. But marketing is trying to get by using PowerPoint and Excel. As marketers are expected to answer more complex business questions, they need to have better tools. But, 22 percent of marketers report their marketing planning software does a poor job optimizing marketing spend. And 24 percent said they don’t know how or if their planning tools help them optimize spend. Link your budget to your available resources. Use metrics to identify places for improvement. Give the entire marketing team access to the plan. Make changes on the fly as necessary. Measure the impact of marketing investments. Measurement: Every good marketer knows it’s important. These days, organizations expect marketing to be able to quickly articulate the impact they’re making. Marketers should be able to measure success, make sure they’re getting the right return, and use metrics to make adjustments and optimize spend. But, only 10 percent of marketers actually measure the results of their plan. My two cents: That’s crazy. Now is the time to focus on revenue. It’s time for marketers to speak the language of the business. Marketers need to take planning more seriously and create unified, goal-driven plans or they risk undermining marketing’s importance. Modern marketing isn’t about running campaigns, getting new email subscribers or racking up Facebook Likes. Those are just tactics in a broader marketing plan. Marketing planning enables new potential. Assess performance through planning and objectives. Identify areas where improvement has a large impact. Track improvement by objectives to assess progress. Focus where you can optimize to revenue goals. Manage marketing to expected performance.